SR training » Presentaties geven in het Engels. Zo doe je dat! Een presentatie geven in je eigen taal is al een hele uitdaging. Als je in het Engels gaat presenteren dan hebben we in dit artikel vele tips voor je. Lees verder. Vaak is er een (gezonde) spanning als je een presentatie gaat geven. Dat kan een presentatie in het Engels zijn over een nieuw product, strategie, uitleg over jaarcijfers of misschien ontvang je Engelstalige gasten voor een rondleiding. Het publiek is er in ieder geval om iets van jou te leren. Ze weten ook niet wat je allemaal gaat vertellen dus vergeet je iets dan is dat niet altijd gelijk een probleem. Hieronder vind je handige zinnen die je kunt gaan gebruiken en voorbeelden hoe je een goede presentatie in het Engels geeft. 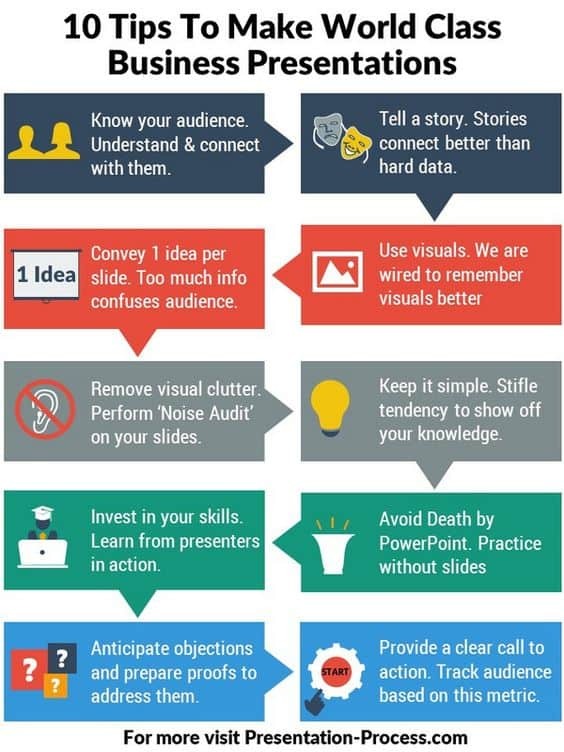 Prepare your presentation well. Remember to keep text to a minimum. Make use of visuals: use video clips, graphs, charts where possible but don’t overdo it. Make sure your laptop is ready and any equipment you need is in working order. Make sure your presentation is stored on your laptop. Arrive early to check if everything is in order. Have handouts ready to give your audience at the end. Never read your slides word for word. Speak with confidence: Clearly, slowly and calmly. Every so often look at your audience. Look friendly and watch your body language. Don’t fly through the information as your audience will need time to digest the information. Try to speak with enthusiasm and not in a monotone tone as you will lose your audience. Don’t spend too long introducing yourself and what you do, just get on with it. Good morning everyone. Thanks for coming. Today I’m going to be talking about…. For those who don’t know me I’m K….I’ll just tell you a little about my background. I’ll start off by telling you a little about…..then I’ll go on to… and finally I’ll .. There will be plenty of time at the end to take your questions. Please feel free to ask any questions as we go along. Video: ‘What to do with your hands’? I’ll start off by filling you in on the background to…. Giving you an overview of..
Let’s take a look at…. Just to digress for a moment. I would like to expand on that. Let’s examine this in a little more detail. I would like to stress/emphasize that..
I’d like to draw your attention to ..
Let’s take a look at this slide. As you can see on this slide/graph/table…. by stressing words which are normally not stressed. Not: It’s the best we can do. But: It is the best we can do. You can make a presentation more persuasive by using simple intensifiers to emphasize your point. There is no hope of reaching our targets. There is absolutely no hope at all of reaching our targets. The project is underfunded. The whole project is badly underfunded. There has been an increase in sales. There has been a dramatic increase in sales. We’re doing well at the moment, but how can we do better? We’re doing extremely well at the moment, but how can we do even better? Because of/due to/as a result. Op deze Engelse site een mooie extra uitleg over vragen stellen in jouw presentatie. 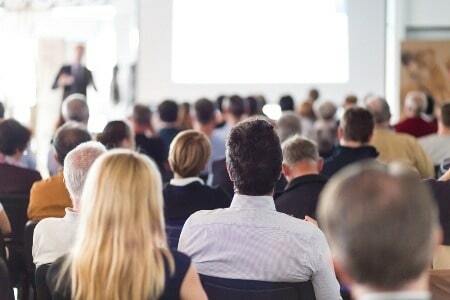 It is easier to involve your audience in the presentation by asking questions. It also gives you a rest if you feel you are getting tired. The longer your presentation takes the more likely you are to make mistakes. By asking questions it involves the audience and gives you the chance to recover. Nobody will be any the wiser. Where + go. Where do we go from here? How soon + see. Tell me, how soon will we see results? What + for. Ok, what are we waiting for? What + looking . Sir, what sort of plan are we looking for? Where + did. People, where did we go wrong? How much + is. Tell me, how much is this going to cost? We hebben een handige eenvoudige- en uitgebreide checklist voor je zodat je weet dat jouw presentatie in het Engels goed is voorbereid..
Deze kun je als printbaar pdf hier downloaden. Bekijk ook dit artikel met een stappenplan over opening-midden-afsluiting van een presentatie. You may want to take questions during your presentation or at the end . If someone asks you a question it is a good idea to think about it before you answer the question. If you don’t know the answer, say so. Never pretend you know the answer as you will only look stupid. Below are some useful sentences. I’m afraid I don’t see the connection. I would like to move on. Sorry, I don’t have the information. Sorry, I don’t follow you. What was your question again? Right, that brings me to the end of my presentation. Just to go over the main points again. Just to summarize the main points again. I started by telling you about…then I went on to talk about….after that I explained …and finally I …. I’ve got some handouts here. Hiermee moet het lukken als je presentaties gaat geven. Heel veel succes met je volgende presentatie in het Engels! (dit artikel komt ons mijn E-book) ‘The Business English Survival Guide’. Hierin staan veel zakelijke onderwerpen op het gebied van Business English. Misschien is de workshop ‘presenteren in het Engels’ iets voor medewerkers in jullie bedrijf. We geven de workshop bij jullie op locatie. Nog meer tips? Wil je vooraf aan jouw presentatie al met enkele mensen praten? Hier lees je wat ‘small talk’ inhoudt. Misschien zou je het artikel met anderen willen delen? Bedankt.